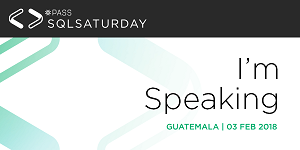 I’m thrilled to announce that one of my proposals has been chosen to be presented in Guatemala’s SQL Saturday that will be held on February 3rd at the Francisco Marroquin University (UFM). If you will be in town and are an enthusiast of SQL Server, you should definitely plan to attend, did I mention is Free? You can check the agenda and register here there are a lot of great speakers, some of them are Data Platform MVP’s. I’ll be presenting what it is, what you need and how to implement it, as well as some scenarios where you can benefit with it. So if you haven’t register, what are you waiting?